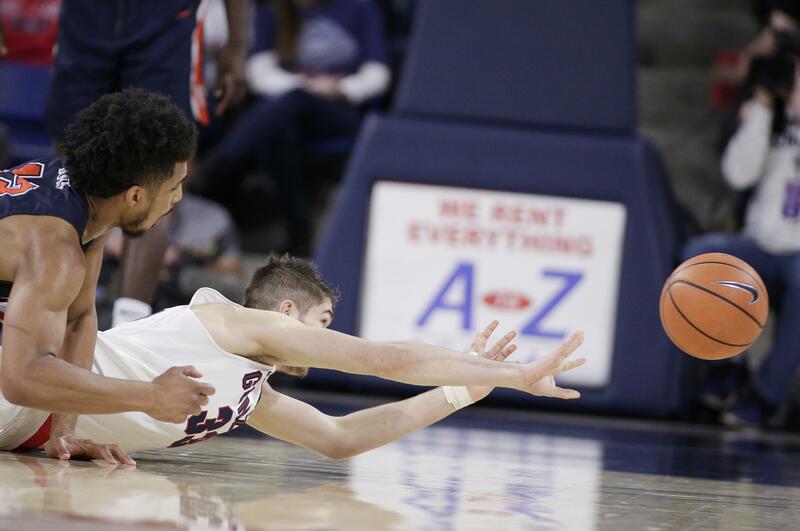 The offensive rebound pinballed off the hands of four Pepperdine players and three Zags. The scrum started in the middle of the lane and drifted out to the wing. Three Gonzaga players and four Waves hit the floor. The ball trickled free again before an alert Johnathan Williams dived and tipped it to Killian Tillie. Tillie went for a dunk and the crowd erupted Saturday inside the McCarthey Athletic Center. It served as another example of the type of hustle/winning plays Gonzaga has made consistently over the second half of the WCC season to put the Zags on the doorstep of another title. The final steps won’t be easy as GU (25-4, 15-1) takes a one-game lead on the road to San Diego, which thumped BYU on Saturday, and BYU, where a crowd of 19,000 awaits. The Zags have been solid in crunch time since sputtering late in a 74-71 loss to Saint Mary’s on Jan. 18. They were in tight home contests deep into the second half against Pepperdine, BYU, San Diego and San Francisco. They were challenged on the road by Pacific and Saint Mary’s last week. The Waves were within 66-64 when the Zags responded with 11 points in a row and 15 of the last 18. The Zags have been battled-tested and have battle scars to prove it. Tillie absorbed an elbow in the first half and needed four stitches to close a wound inside his mouth. On Thursday, he got smacked in the back of his head in pursuit of a loose ball. He left the court but everything checked out OK in the training room. Norvell, who had stitches to close a cut above his left eye in the Saint Mary’s game last week, drew a charging foul on Pepperdine’s Jadé Smith with 6:11 remaining. Silas Melson took a charge in the first half. Pepperdine traded blows with Gonzaga for most of the game, but couldn’t keep up in the final 7 minutes. Williams, Tillie and Norvell made several key plays at both ends of the court. Gonzaga’s 78-65 win over Saint Mary’s never reached the squirming stage, in part because Perkins’ baseline jumper slowed a Gaels’ rally. Norvell hit a clutch 3-pointer to help subdue BYU. Two Norvell 3s and a Perkins’ three-point play closed out San Diego. Williams delivered late in the win over USF. The Zags made 28 of 30 free throws in the final five minutes against San Francisco, San Diego, BYU, Pacific and Saint Mary’s. They went 23 of 23 in the last three minutes and 19 of 19 in the final two minutes. Published: Feb. 18, 2018, 4:46 p.m. Updated: Feb. 18, 2018, 6:07 p.m.